At first I tried to model my dad’s knee high socks with a skirt, but I came out looking like some kind of German frau. So, I got a little more comfortable in my surrounds, channeled Knitting Lingerie Style , and the result was much better. 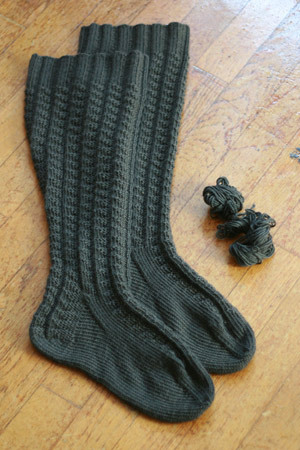 Pattern: Gentleman’s Shooting Stockings with Fluted Pattern from Nancy Bush’s Knitting Vintage Socks . Yarn: Louet sportweight Gems merino in charcoal (#49), a generous gift from Shaina. Two skeins of this 100% merino (225 yards/skein) were just enough for a pair of knee high socks: 2.8 grams left over from the first skein, and 3.7 from the second. Needles: Susan Bates Silvalume dpns , US 2 (2.75 mm). I have two sets of these (8 needles total), so I’m able to knit in the round using 5 needles. Perfect in length and size for this project. Size and gauge: Unworn (so, unstretched) the socks measure 18″ from the top of cuff to the sole and 12.75″ around the widest part. The fabric stretches to cover my 16″ calves without any strain. My gauge in circularly-knit stockinette was approximately 6.5 stitches and 9 rows per inch. Different gauge, different needles, different desired size, but I’m so glad I didn’t (and didn’t have to!) modify the leg portion of the pattern that much: it’s totally gorgeous! Unworn, the calf decreases looked weird and asymmetrical, but once the stockings are on (as I now see), the movement of the stitches seems natural. The stitch pattern down the heel flap is a nice touch, and I’m glad I was able to keep it. Remember how I had to break up a pattern repeat when I got down to the heel flap? I hope you can see that working purl stitches on the edges of the heel flap and knit stitches on the edges of the instep was probably the most unobtrusive solution. The stitch pattern, with its triangular areas of knits and purls, is easy to memorize… and mess up! It adds dimensionality and a ribbing quality to the fabric, which I think my dad will enjoy very much. I think these knee high socks will keep his legs nice and toasty. Beautiful patterning on the calves. Good to read that I’m not the only one who’ll mix it up with aluminum needles! The calves are a real work of art! Very nice, love the texture of these. You give me hope! I just finished the decreasing section on these same socks and they look pretty funny unstretched. I was beginning to worry. Now I will press on! The shaping is absolutely amazing, and I’m glad it worked out despite all the mods! I have this book but didn’t feel particularly drawn to the pattern with the book photos. Now I feel differently. It’s going on my list of someday socks! Oh, they’re gorgeous! I love the colour, and the stitch pattern is lovely! the stitch pattern is so full of texture. Wonderful job! Oh, WOW! They are beautiful! Excellent job, once again. Lovely job! Great, great pattern. Beautiful! I love how the decreases work. I still haven’t knitted this pattern from KVS – I really should give it a try! Oh, very pretty! Your dad will love them! Beautiful! I think I’d find it really difficult to give these away. The shaping looks superb! I definitely agree that these would be hard to give away. They are really beautiful. Great pairing of the pattern and the yarn color. Yay for calf increases! These are great! They look great! I love the calf shaping details. Beautiful! I’m a convert to calf shaping these days and love to see the different ways people work it into their socks. I love how these turned out! Gorgeous socks! I’m sure your father will enjoy them. Lovely socks! The calf shaping is amazing! I love the calf shaping and the last shot — v. cute! Holay molay, those are gorgeous! I’m knitting my first pattern out of KVS right now, and wow(!) is Nancy Bush brilliant! Next stop, Gentleman’s Shooting Stockings! Lovely work, your dad is a lucky man. Gorgeous! I love the back! Great job – those are gorgeous socks. :)You have inspired me to make a pair for my father. He would love those! When are you going to make a pair of socks for you? I love how the decreases look on the back of the legs. Oh la la! What a photo shoot! Those socks are awesome! Wow.. they are awesome.. the calf decreases give them that ‘WOW’ affect! Beautiful work on the calf shaping. Your father is so lucky. Beautiful socks. The back of the sock is fantastic! They looks great! Like everyone else, I am marveling at the calf shaping. The socks are lovely and your photography really showed them off! I don’t think I’ve ever made sport weight socks, and these ones are stunning. I can’t imagine knitting them in anything other than a solid or semisolid, so it is a good thing that those aren’t that hard to find! Well done, as always! I really appreciate that you take the time to walk us through what works and doesn’t and, more importantly, *why*. Thanks, Kathy! I can’t even begin to tell you just how lovely those are! The calf area is just wow, oh my god, I gotta make a pair for me me me me me, lovely! The German frau photo is hysterical! All that picture is missing is a stein of beer. I have really enjoyed being along with you on the journey to make these socks. Wow, those socks look terrific. You must be very proud of them. I am sure your Dad will love them too, albeit for different reasons.